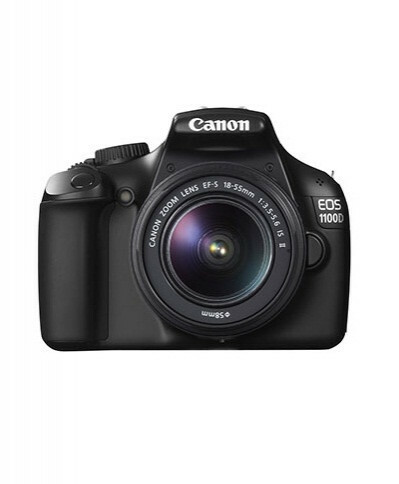 Advanced, compact and affordable: your first steps into the world of DSLR photography, made simple with Canon EOS 1100D. Step up to DSLR image quality with a 12-megapixel APS-C-sized sensor. A 14-bit DIGIC 4 image processor provides up to 3.2fps continuous shooting and images that are packed with detail and tonal range. The EOS 1100D's Feature Guide provides descriptions of many of the camera's functions, as well as advice on how to use them in your own photography. Theme-based Scene modes automatically pick the most suitable exposure, focus and drive-mode settings for the subject being photographed, while Creative Auto mode portrays adjustable functions in an easy to understand way. With Canon's Basic + technology, the look and feel of these basic auto modes can be fine-tuned according to ambience and lighting type. Shoot stunning HD video at 25 or 30fps, with automatic exposure control leaving you free to concentrate on the action. Footage can be edited on your PC or Mac, or played directly on an HD TV via the camera's HDMI connection. Low-light shooting without flash is possible thanks to the EOS 1100D's ISO 100-6400 sensitivity range. The camera's 14-bit DIGIC 4 processor helps to control noise and maintain image quality. The EOS 1100D focuses quickly and accurately on static and moving subjects, thanks to nine AF points, spread out across the frame. A central cross-type AF point is sensitive to both horizontal and vertical lines. Advanced iFCL exposure metering dissects a scene into 63-zones before analyzing it to find the perfect combination of shutter speed, aperture and ISO. Compose and review images on a large 230,000-dot LCD screen, which also provides access to the camera's menu system and Quick Control Screen. The EOS 1100D is supported by the complete range of EOS lenses and accessories: flashguns, remote releases and a system of more than 60 lenses trusted by professional photographers the world over.